The first week of the anxiety diet went well. Being sugar-free allowed me to start having more energy and feel quite good generally. The anxiety symptoms seemed to come and go with sugar and I also got a bit worried about chest pain which seemed to be linked to high blood sugar. But as I know what brings it on, i.e. not eating or eating sugar and carbs, I can avoid it by eating regularly and avoiding sugar. I have identified some major challenges to this diet, however. The first one is time. Because of the long commute and regular overtime I don't seem to have enough time to do this diet as well as I want. Second challenge is self-discipline - I struggle to plan my meals ahead so am now looking for a quick, easy, healthy and affordable way to eat that doesn't require a lot of food preparation. The third challenge is cheese. I haven't given up cheese yet and because of it I am phlegmy and sometimes can't get my words out clearly due to coughing or itchy throat. This has a huge impact on confidence levels. So this week I will quit dairy. I also tripped up and had a one glass of wine last week but apart from that, generally, I felt more confident and energetic than in recent times and that was quite exciting. I am expecting my hair analysis results to come back this week and will start my supplement plan accordingly, depending on what the results are. In terms of exercise, I am struggling to fit it in my daily plan so perhaps now in the beginning it will have to take a 'back seat'. Jump to: Day 9, Day 10, Day 11, Fell of the Diet, List of Measures to Alleviate Anxiety, Day 12, Day 13, Day 14. Catch a train at 7.20am. Update website on the train. Arrive at home at 7pm. So actually I think I could just about do it as long as I don't have to work overtime. There are tasks that would not need to be completed every single day, like preparing lunch only every two days, and preparing slow cook meals maybe twice during the working week. And when my boyfriend cooks then I would also save some extra time. So sometimes this spare time will be used to work overtime, but if not, I could replace them with 1) guided meditation/ subliminal tracks 2) self-hypnosis 3) relaxing with/ meeting other people. 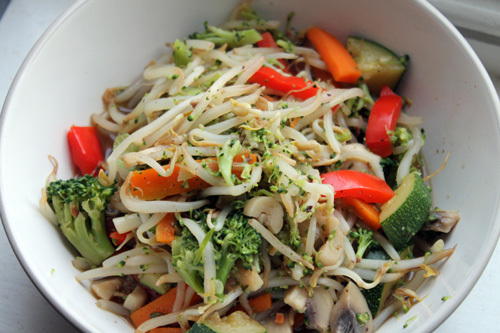 A good anxiety-reducing food: replace normal noodles with bean sprouts, which don't spike blood sugar and are a lot easier to digest. Crunchier but tasty, and you don't get a tired, fat-belly feeling after. In any case, if I could get two more hours into each day, my life would be so much better! If I could only sleep six hours per night... So I've spent some time collecting tips on how to sleep less. [Update: The list is saved here now: How to Sleep Less]. Update: This schedule seems way too strict to be doable. It is impossible to go through all weekdays without any time to relax and enjoy oneself. I didn't stick to the above schedule very well and I don't suspect I ever could or would want to! Jump to: My daily schedule, Day 10, Day 11, Fell of the Diet, List of Measures to Alleviate Anxiety, Day 12, Day 13, Day 14. Soya milk porridge with goji berries, seeds, bananas and some honey, yoghurt on the side. Three vit C capsules, one rhodiola. Snack: Granny Smith (sour) apple with cashew nut and peanut butter (both sugar-free). Plenty of redbush and schizandra berry tea throughout the day. I seem to feel more dehydrated after drinking hot tea. I will try tomorrow not to have any tea, just water. Quinoa, chickpea, etc. pot from Crussh with another pot of parsley, avocado, butter beans, etc. I felt like some heart palpitations after but not for long (perhaps the tomato). Just got at home, 7.50pm. Still feel very energetic, and been feeling so all day, except at work, where I get a little bored and have to struggle a bit to keep focus. Two eggs fried with butter and tomato. I had a little lower-belly ache and very hard stools tonight - perhaps because of the psyllium husk. On the other hand I wonder if some parasites are dying because I have been passing quite a lot of air for the last two days and this is not normal for me. Went to bed too late, about 11pm. Jump to: My daily schedule, Day 9, Day 11, Fell of the Diet, List of Measures to Alleviate Anxiety, Day 12, Day 13, Day 14. Woke up at 6am, feeling like I got too little sleep (after 7 hours). Soaked oat groats with sweet and sour berries from frozen. I am tempted to do an experiment of sleeping very early to see if I need less sleep that way, because the time after dusk is meant to be the deepest sleep time for our bodies. I also read about biphasic sleep, which means sleeping two times a day - typically at dusk and dawn - and being awake during the night. I wonder if I could get it to work by sleeping 8pm-1am and 5.30-6.30am - in total six hours. That would be very cool and would be fine in terms of work times. And it would leave a 4.5h "day" in the middle of the night I could use to do my own stuff. Not sure yet if I will try this or not... there will probably be a adjustment period when one would feel very tired. Some people I saw talking about biphasic sleep, however, who slept in the middle of the day, as well as at night, seemed to have adjusted quite quickly and easily, as long as their sleep times stayed regular. Snack in the morning, 12 noon: one banana. My face was a little bit red in the morning for no reason and then talking to some random person I didn't even know made my face go a bit more red. I think I have been eating too much sugar. Lunch at 2pm: Smoothie: one granny smith apple, lettuce, hemp seeds, hemp leaves, chia seeds, maca, one lemon, fo-ti, liquorice powder, burdock root, water, poppy seeds, sesame seeds. When I sat at my desk after lunch I felt very dehydrated, despite the fact that I had been drinking some salt water and lots and lots of filtered tap water all morning. I started feeling weak in the afternoon again, I think I ate too many carbs and sugar. I don't think the oat groat breakfast is ideal, perhaps too high carb, and maybe also the banana and apple were too much sugar. 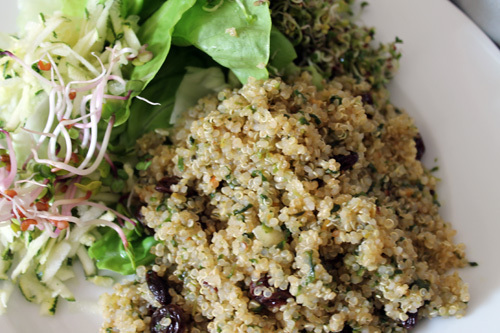 Quinoa is full of protein, and a brilliant replacement for rice, couscous or other grains. The secret is to rinse it thoroughly after cooking, otherwise it can have a strong side-taste. Granny smith apple with cashew, hazelnut and peanut butter (sugar-free). I felt a little better after the snack, probably because of the protein, which has a blood-sugar balancing effect. I didn't have any tea or hot drinks today, just filtered tap water. I don't feel much different, mouth is not much clearer like it has been in the past when not drinking hot drinks - my tongue still feels coated. Come to think of it, I have been pretty high raw today by accident! The breakfast was raw, so was lunch and snacks. The only thing that wasn't raw so far was the peanut butter. I have a lot of gas in my belly again, it's been like that for three days now. A little belly ache too because of it. 8pm, blood sugar before eating: 5mmol - very good. I just fried two eggs for dinner, with olive oil, and ate some Gouda cheese. This night was quite a difficult night, because of some personal problems. Had a lot of stress and some chest pain. Very dehydrated also. 10.20pm: blood sugar 5.7mmol, heart pounding (palpitations). Update: I get heart palpitations and dehydration from sugar, carbs, stress and from not eating often enough. Jump to: My daily schedule, Day 9, Day 10, Fell of the Diet, List of Measures to Alleviate Anxiety, Day 12, Day 13, Day 14. Smoothie: One lemon, lettuce, spinach, water, chia seeds, poppy seeds, sesame seeds, goji berries, turmeric, schizandra berry powder, hemp seeds, hemp leaf. This smoothie tasted alright. Wouldn't go as far as saying that it tasted good, but good enough to drink. Feeling tired today, slept from about 10pm to 6am but not very well... Kept waking up because of stress. I felt down today and so was tempted to eat something for comfort. Not sure if sugar numbs down your feelings but you certainly feel like eating it when not feeling too good. I resisted the temptation, but had decaf green tea at work (which still has a little bit caffeine in it) for the same reason - I felt like I needed it as a pick up since I wasn't feeling 100%. Will try to sleep very early today and see if I need less sleep. This idea is based on the finding that we are supposed to have more of the deep 'delta' brainwave sleep in the first few hours right after dusk. I will also use the Sleep Cycle app to see how deep sleep I get. Lunch: Lettuce and spinach salad with fresh red pepper and vegetable curry: chickpeas, cauliflower, tomato, sweet potato, brussels sprouts and spices. Afternoon drink: Green smoothie made of lettuce, spinach, hemp leaves, hulled hemp seeds, goji berries, turmeric, chia seeds, sesame seeds, poppy seeds, water, one whole lemon. Drinks: Lots of decaf green teas, redbush tea, one schizandra berry tea. I felt tired and demotivated all day today. I need a good night's sleep and will be back to normal. I feel so tempted to drink or eat something sugary today. 8pm: I ended up having a chocolate bar and a cider. But at least I can monitor my blood sugar levels in two hours' time. 11pm: 5.8mmol after two ciders and Chinese food (veg curry): 5.8mmol. So my blood sugar has clearly got higher but still within normal range. Nowhere near diabetic levels, if I understand correctly. 11.24pm: 6.0mmol, no heart palpitations or chest pain. Still within the normal blood sugar range. Jump to: My daily schedule, Day 9, Day 10, Day 11, List of Measures to Alleviate Anxiety, Day 12, Day 13, Day 14. So the following day (Friday) I fell off the diet. The usual thing happened. When I allow myself to have a drink of alcohol, the next day I feel like I need heavy comfort food. So I had a cheesy croissant for breakfast. And another croissant for lunch, as well as chocolate brownie, and so on. I felt more tired straight away eating this way but it seemed as if the immediate negative effects of sugar and carbs were not as pronounced as usual. But I did start to feel weaker in terms of confidence levels and my face got more red again. At 6.30pm my pulse was 71bpm and my blood sugar 5.8mmol. The elevated pulse most probably indicates having eaten foods I am intolerant to sometime during that day but the blood sugar is normal (though elevated). And Sat morning at 8.40am my blood sugar was 5.2mmol, so not hypoglycemic as you might expect to have in the morning if you suffered from bad blood sugar swings. I will return to the diet tomorrow (on Wednesday), having eaten partly very healthy and partly not so in between. I've had some sugary things and pastries. As I continue, I will cut out dairy also, and eggs, in addition to cutting out sugar and processed carbs, because I want to not have phlegm and have a clear voice etc. I have also started taking a B vitamin complex and a probiotic now, since Friday. I have done a little bit of stretching and exercise but will try to prioritise this high in the future. I might want to eat high raw but it depends a little bit on what the hair mineral analysis reveals when the test results finally come back! Jump to: My daily schedule, Day 9, Day 10, Day 11, Fell of the Diet, Day 12, Day 13, Day 14. Printable sheet (pdf, A4 size) of the above diet tracker sheet here: diet tracker. Hopefully this system will make it a bit more fun, a bit quicker and space-saving way to report on my days and easier to enjoy the tasks, so as not to feel burdened by trying to do too many things in one day. All these points help fight my anxiety/ increase self confidence and I have tried to reflect the importance by the amount of points allocated. Jump to: My daily schedule, Day 9, Day 10, Day 11, Fell of the Diet, List of Measures to Alleviate Anxiety, Day 13, Day 14. I'm back on the diet now, after taking a few steps backwards. Did some quick exercises in the morning. Spirulina, lemon, kelp, hemp leaf and water smoothie. Mixed berries, maca, goji berry, lettuce, chia seed, sesame seed, poppy seed, almond, turmeric, fo-ti, burdock root, liquorice, hemp seed and hemp leaf smoothie. I did everything really quick this morning, super-speed, and made quick and easy lunch: two smoothies. I also took some bananas with me. These may not be enough for the day but were so quick to make, I think it is a good lunch option. I want to start eating in a way that I just drink smoothies while working, and snack on fruit, veg, nuts and seeds, leaving the whole lunch break free of eating or food prep, so that I can go for a walk or do something else. 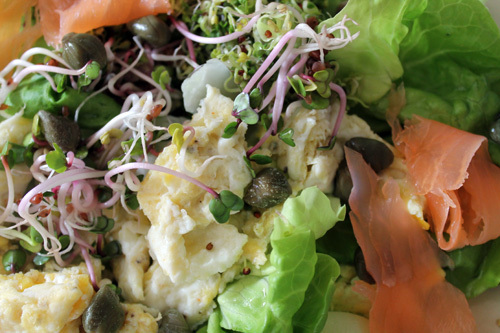 Salmon, egg, capers, lettuce and sprout salad is a good anti-anxiety dish. Just beware that much smoked salmon has sugar added. Lunch: The same as breakfast, two types of smoothies. Snacks in the afternoon: Two bananas. Tea: lots of decaf green tea, redbush tea, schizandra berry tea, water. The hair mineral analysis retest report came back today and the news were brilliant! I have no more sluggish adrenal glands, in fact they are a little too active now, and I am detoxifying copper and calcium fast. A little stress and inflammation was shown on the report but apart from that my only problem was sugar intolerance, which is quite severe, as I already know. Digestion is better as well as vitality, based on the mineral analysis. I am detoxifying many thins which shows better general strength. I think that the main things that have helped with this huge improvement in my health have been: the nutritional balancing programme supplements and advice, the Chinese Doctor's advice and treatment (acupuncture, infrared light and herbs), as well as the Himalayan salt I have been taking. Staying away from sugar and carbs must have been a huge help a well. But I will need to continue doing all this! The report also mentions that my thyroid is getting stronger although there's some way to go still. The anxiety, according to the mineral analysis report, is linked to detoxifying copper (because large amounts of copper end up in your blood before they get taken out of the body). This would seem to indicate that if I take the new supplements recommended by the nutritionist and continue the copper detox, I will naturally come off any anxiety problems with time. But the way the copper causes anxiety, at least partly, is because it causes blood sugar problems and exaggerated stress reactions by the body. So if I can alleviate anxiety while detoxifying copper - which makes everything harder - I should be able to alleviate anxiety anytime! So the adrenal glandular supplements clearly caused anxiety as well for the specific reason that my adrenal glands had already healed and so got overstimulated by the supplement. I was kind of guessing that that might have been what was happening. Snack on the way back from work: lightly salted Kettle crisps. In the evening I did trauma release exercises as well as a few other exercises and stretches. I ate very little, some sprouts, and went to bed. Point references: 2, 3, 4, 6, 7, 10, 11, 12, 13, 15a, 25, 26, 37, 39, 43, 44, 46. Jump to: My daily schedule, Day 9, Day 10, Day 11, Fell of the Diet, List of Measures to Alleviate Anxiety, Day 12, Day 14. Spirulina and lemon smoothie for breakfast, sprouts, two 'Naked' nut bars. Lunch: Butternut spinach curry with brown and red rice (from Crussh). Had coconut milk and a little carrot from the stock cube. I realized this soup had preservatives in it, however. Brown rice and home-made chickpea curry with mixed sprouts. Snacks and drinks: Three mandarins, a few Brazil nuts, pack of black pepper Kettle crisps, lots of decaf green tea, redbush tea, schizandra berry tea, filtered tap water. I had too much sugar today, didn't feel very good. Too much decaf green tea too (it still has 1/10th of the caffeine of the normal green tea). I don't feel I need caffeine at all anymore to wake up, but somehow I feel that it helps to concentrate. However, it's still unnecessary and probably just a habit that needs changing. The nut bars were mostly made of dates and tasted very sugary (although they had no added sugar of any kind). I felt good in the morning but as soon as I had eaten them I started getting a slightly painful/ heavy feeling around my heart area and a little bit of heart palpitations. I also think that the rice provided too many carbohydrates for my pronounced sugar and carb intolerance. In the afternoon I had a headache and in the evening I started feeling the usual weakness that follows once I eat sugary foods: achy arms and legs, tiredness, weakness - it doesn't feel like usual tiredness. I think the weak feeling may have been triggered by the green juice I had, which had apples in it - thus the juice had fruit sugar without the fibre that would come in a whole apple. The fibre would slow down the release of the sugar (protein too would have slowed down the sugar release). Point reference: 2, 3, 6, 7, 10, 12, 13, 17, 21, 23, 25, 26, 43, 44, 46 (these are the actions I got points for). Jump to: My daily schedule, Day 9, Day 10, Day 11, Fell of the Diet, List of Measures to Alleviate Anxiety, Day 12, Day 13. Woke up feeling much better than yesterday. I feel quite strong and energetic this morning. Did a few exercises in the morning, really fast, made smoothies for breakfast and lunch, took supps: B-vit and probiotic. Smoothie 1: Water, lemons, spirulina, kelp, sesame seeds, hemp leaf, turmeric, almonds. Smoothie 2: Water, sour apples, mixed sour and sweet berries from frozen, lettuce, goji berries, turmeric, chia seeds, he shou wu (fo-ti), burdock root, liquorice root, avocado. 8.45am: I felt so good this morning but now starting to feel quite tried, sitting on the train. Lunch: Same smoothies as for breakfast. Drinks: schizandra berry tea, other herbal tea, redbush tea, spring water, tap water. Snacks: A few Brazil nuts, a few pecans, a sour apple with cashew nut butter. I didn't get any low blood sugar symptoms today. A slight shadow of a headache but nothing much. I feel it's very difficult to be in the stuffy office all day, and I think all the positive ions everywhere (that get emitted especially by the computers) really get to me. So I don't feel tired now after work but I feel worn out and my neck is very stiff again. I got huge pastry and alcohol cravings again on the way home. A little brown rice, home-made chickpea curry, sprouts, lettuce, etc. A huge portion. Not sure that this was a good idea, felt a bit achy soon after. Point reference: 2, 3, 6, 7, 10, 12, 13, 14, 15a, 17, 25, 26, 27, 33, 37, 43, 44, 45, 46. Next: Week Three of Anxiety Diet Diary. Or jump to: Anxiety Diet Conclusions. Jump to: My daily schedule, Day 9, Day 10, Day 11, Fell of the Diet, List of Measures to Alleviate Anxiety, Day 12, Day 13, Day 14.